Thread: River class Patrol vessels..
NS not unwilling to commit, it's DOD who put the kaibosh on any hope of a flight deck on a new class of OPV. All that is required is a flight deck (HIFR at a stretch note S92s don't have HIFR capability), the P31 experiment was too much as the helis were a specific Irish design, the equipment fitout for P31 as per AC requirements was far too high & never fully utilised (ship never had a requirement to be able to change out engines, etc; even though it was equipped to do so. So that's what that gantry crane in the hanger was for . Helps had Irish spec not design. Sa 365 continues in service as do our own except the end user tried to make it something it could never be. Ironically the reason behind equipping a ship with a helo has long since passed and the role envisaged can now be filled by a UAV. Unless someone comes up with a very credible specific role NS vessels don't need to be helo capable. 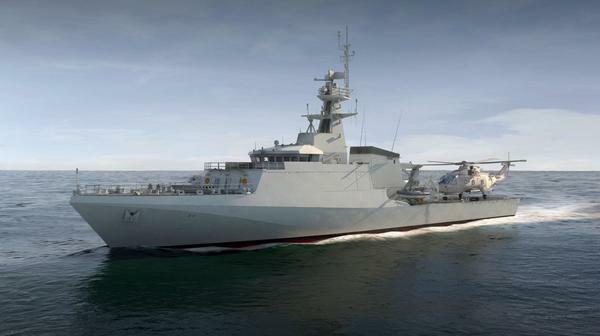 BAE systems commence construction on 3 OPVs. even if we dont need helis on vessels, surely it would make sense to have a multi role after deck that COULD be used for medium sized helis eg in disaster relief missions or long range HIFR SAR refuelling with CG but also for other tasks such as UAV launches AND cargo handling of ISO containers? how much would the extra cost of aviation fuel containers, pumps, and deck strengthening cost? Didn't someone on here say the new CG choppers can't utilise HIFR? And.................wouldn't it make sense to know?...................you know, before clogging up all the afterdeck with that sh1t that can't be used by the CG? Who says that the contract will be renewed in 10 years or that the helis wont have a requirement for it in the future? the ship will last 2 - 3 whitepapers. better to have a capability than to try and retro fit it. you have to build it around a rough idea, so for example if you built an OPV with the space/weight to take a Merlin/Chinook, you are future-proofing it against pretty much every/any medium lift helicopter that will be built in the next 30 years. i see the decision to build the new OPV class without a rudimentary/basic helicopter capability as spectacularly short-sighted - these vessels will be in service in 2050, and a lack of a flight deck means no counter-piracy/CT missions for the next 35 years... it means saying 'these are the requirements to do the job right now, and i have decided that they will be exactly the same, and the job will be exactly the same, when the NS's newest officer cadet is pushing for the COS job and when most of the people on this site will be either dead, or drooling into their Horlicks. as one sorely missed from here used to say, steel is cheap and air is free. Never heard of HMS Blake, laid down 1942, commissioned 1961, decommissioned 1979!!!! In fairness, helicopters were just about in service when she was built. RFA Argus is a converted container ship that has seen operational service all over the world. Last edited by DeV; 10th October 2014 at 22:28.
agree. have been saying the same thing elsewhere on the forum. It is bad and inexplicable in professional terms. Whoever is responsible will, as usual, escape scrutiny or consequence while the NS will struggle with this defect-for it is that- for the life of these ships. It is such a pity and it would have taken so little to futureproof these vessels. Did you ever consider that they are future proofed and the decision was made to have the deck capable of operating UAV and ROV, instead of wasting space on heli ops where no suitable helis are currently in use or proposed? If you think it takes "little" to add a helideck to a design, you are grossly mistaken. Keep in mind that there already exists 2 variants of this design equipped with a helipad. Those who know about these things decided the option was unsuited to our needs. Did you ever consider that they are future proofed and the decision was made to have the deck capable of operating UAV and ROV, instead of wasting space on heli ops where no suitable helis are currently in use or proposed?.. so 'future proofed' for 30-odd years - but only insofar as allowing them to operate currently operated/planned systems? perhaps the NS aren't thick, but found that politicians and MOF aren't either - if you build ships with flight decks, at some stage some bright spark will ask why you don't fly helicopters from them..? so, can you educate us - give us 3 reasons why you would not want a flight deck on a patrol vessel? Having a heli deck (or a heli ) on a NS unit would be a prime example of having the tail wag the dog. 1. We don't have the experience required. We tried to start from zero before, but once the knowledge went, it was gone for good. 2. We have no military aircraft in the island capable of landing on a naval vessel. 3. We were down this road before, we couldn't justify the need for a helipad, hence there is now a large crane in the corner of what was Eithne's helideck to make some use of the space. 4. 90% of the time, during patrol conditions, it is impossible to carry out heli ops on a vessel of this size. You may have noticed when foreign helicopter equipped naval vessels of all sizes visit, they rarely have their heli aboard. The reason is, the USN/RN/French have already accepted this fact, and send their valuable air assets somewhere they can be useful. 5. A helideck is not just a flat bit of deck. It is fitted with navaids, tie down points, and most importantly a safe place for the required crew to work. If you are not using it for helicopters, you can't use it for much else. I give you the following clips in my defence. The above is in good conditions. This is normal Western Approaches conditions. 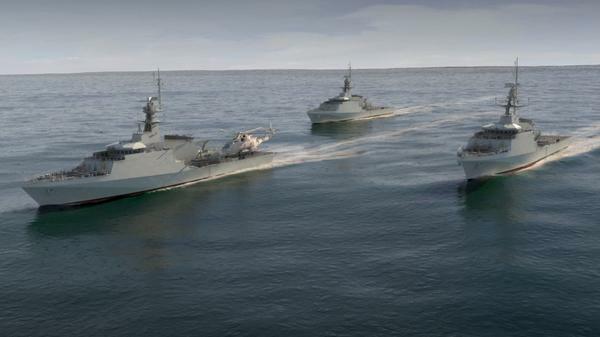 The tender for the OPVs became a contract (and the option has been exercised). Giving that the closing date was over 6 years ago any EPVs would probably have to be tendered for again as the submission (and prices) would be out of date. with respect, you are conflating having a flightdeck with its use in the current EEZ, and only that. i'm talking about the possible need to operate the ships in the Med, or the Baltic, the Arctic, off west Africa or in the Indian Ocean..
i would suggest that future proofing the vessel means equipping it, or allowing it to be equipped in the future, with capabilties you do not currently need, but might do in the service life of the vessel. i would remind you that these vessels will be in service in 2045/2050 - the equivilant of predicting in 1980 what the defence needs/doctrine/posture of 2015 would be. in 1980 Charlie Haughey was Taoiseach, the PIRA hunger strikes had not yet happened: anyone who had predicted in 1980 than in 35 years Irish troops would have been operating under NATO command in Afghanistan for a decade, or had undertaken EU operations in Chad, that Ireland would be member of NATO PfP, or that Irish troops would be operating under UK command on a mentoring/training mission in Mali, would, i think, have been locked up and put on some very strong medication. predicting what won't be the situation 20 or 30 years down the line is a fools errand - by building vessels that can't do flight ops for the next 35 years the Irish government has almost certainly shot its successors feet. Given the Eithne / Air corps experiment was given 6 years with One detention resulting from the helo ops in its designated primary role, a role that is no longer required, can you not see the lessons learned that there are now alternatives to having to be able to operate a Helo from naval vessel. The CG/ NS argument, its not going to happen ever..ever because of the politics involved between the departments involved. Neither will surrender its budget to do the others job. There is no requirement for the CG to be able to operate from Naval vessels neither is there a service provider in the world that can do so. The cost of having an operator capable of operating would make the contract unfeasible. the current class will not be fitted for flight OPs..end of! Given we don't know what the next class will be we can't say there will or won't be a flight Ops option but there would have to be a radical mindset change across the board, massive investment in the flights ops aspect alone before it could happen. You won't see it within 10 years. The government or europe won't spend money on a 'just in case ' basis. You need to put forward a business case, and given the last shot at is still to be seen in living grey and can be identified as a failure in the role and people associated with the project are alive and well and still serving....not going to happen anytime soon. There are many arguements why it should be there, we are telling you the reality of why its not there and what the barriers are. 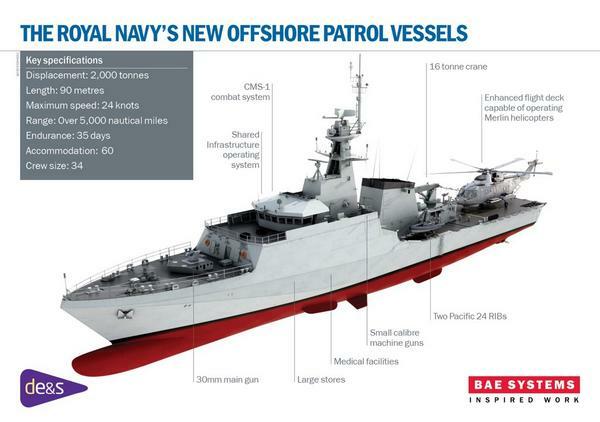 Correct, may never be reached if building OPVs proves to be cheaper and they are reckoned to be more efficient.